We saw a hint yesterday but today we got the confirmation. 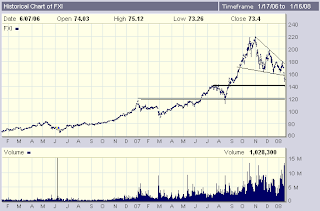 The iShares FTSE/Xinhua China 25 Index ETF (FXI) has been carving out a wedge-shaped chart pattern for weeks but it has now broken to downside. On October 31, 2007, FXI established its peak closing price at $218.51. At today's closing price of $151.81 it is now down about 30%. With huge gains in Chinese stocks over the prior year, China has been referred to as an equity bubble. For some months, however, it has appeared that Chinese stock markets were getting tired. On the charts, it could be seen that the price action in FXI has been increasingly compressed into the wedge mentioned above. As we got to the end of the wedge, expectations have grown for the ETF to finally break out one way or the other. The situation may have been resolved today and it appears to have been resolved in favor of the bears. Two days with downward gaps have taken FXI from the top of the wedge to clearly below the bottom of the wedge. These moves have been accompanied by very volume. I suspect we will now see some congestion around $151 to $152. Traditional technical analysis would then indicate a drop down to the next support level in the $140 range (thick horizontal line). From there we could go all the way down to $120 (double horizontal line). Assuredly, $120 would be close to a 50% drop. In a normal situation, that might seem excessive. If you buy into the "bubble" evaluation, then 50% might seem reasonable. In a recent post titled "Expectations for China" I tried to identify whether the fundamentals were in place for a resurgence in Chinese equities or whether the bear case was justified. It seemed clear that the Chinese economy will remain strong. It has a growing domestic economy and it is quickly ramping up trade with other emerging markets; both developments will help insulate it from a US recession though perhaps not from a severe US recession. Still, with inflation growing and speculation rampant, the Chinese government has been trying to put the brakes on the economy. In other words, the economic picture is not exactly crystal clear. With regard to stocks, however, there are two questions that must be answered. First, are Chinese stocks overvalued? Second, and more pertinent to the ETF FXI, do US investors think the basket of stocks underlying FXI is overvalued? I have noticed that FXI does not exactly track the performance of the Hang Seng or Shanghai indexes, for example. It often trades more in tandem with the S&P 500. It seems to reflect US investor attitudes toward the 25 Chinese stocks in the ETF in particular and the Chinese stock market in general. That attitude, however, seems to be strongly colored by whatever is currently going on in US markets. With the serious weakness in US markets in 2008, it is not surprising to see FXI break out to the down side.